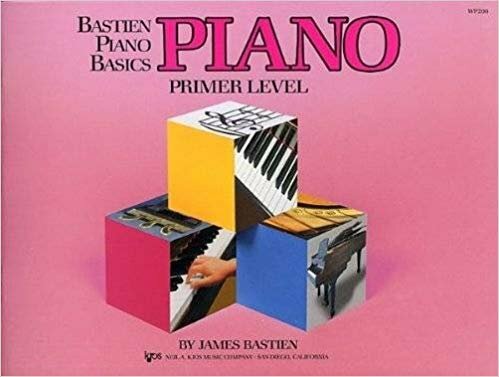 Piano is the main lesson book in the Bastien Piano Basics course. The carefully graded, logical learning sequence assures steady, continual progress. Original music by the Bastiens includes a stimulating mixture of pop, folk, classical, and contemporary styles. Full-color illustrations throughout entertain and reinforce musical concepts along the way. The gradual multi-key approach takes students through all 12 keys -- 3 in each of Levels 1, 2, 3, and 4. Each page is carefully correlated page-by-page with Theory, Performance, and Technic. All in all, a dynamic way to introduce students to the marvelous world of music! The Primer Level is for average age beginners (7-11). It uses pre-staff notation before introducing the grand staff. Reading is presented with steps, skips, and repeated notes. Music includes a variety of original works, folk songs, and pop styles, many with duet accompaniments.